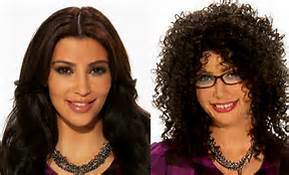 Kim Kardashian went for the Ugly Betty look in the new Oxygen series Celebrities Undercover. The 33-year-old reality starlet completely transformed herself for the premiere episode of “Celebrities Undercover,” hosted by Wendy Williams, on the Oxygen network Tuesday. Kardashian was unrecognizable as she ditched her usual stylish ensembles and sleek hair for a wild curly ‘do, glasses, spaced-out teeth and a plaid outfit paired with leggings. Kanye West’s bride-to-be called herself Cynthia as she sat among three Kardashian fans and pretended to interview them to be her assistant. The three super-fans had no idea they were sitting right next to their idol as they were quizzed on their knowlege of the Kardashian star . One test — a fake assistant tells the women that Kardashian spent the night with rapper Eminem to see if they’d spill the scoop to a gossip reporter, the girls were offered $5,000 for the story about Kim hooking up with Eminem, but they declined the offer. Even sister Kourtney was fooled by the make-under — when she showed up, she mistook “Cynthia” as one of the fans auditioning to be an assistant. Would you reconigize Kim if you were to meet her dressed up as Cythina? For more celebrity transformations watch “Celebrities Undercover” airing Tuesdays on Oxygen Media at 10:30 p.m.